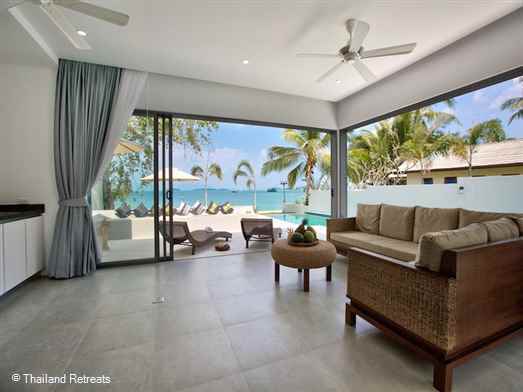 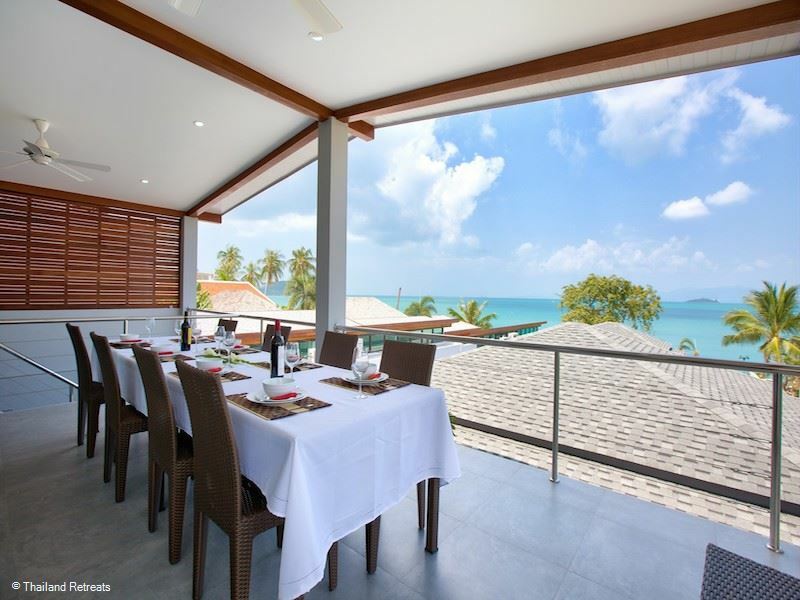 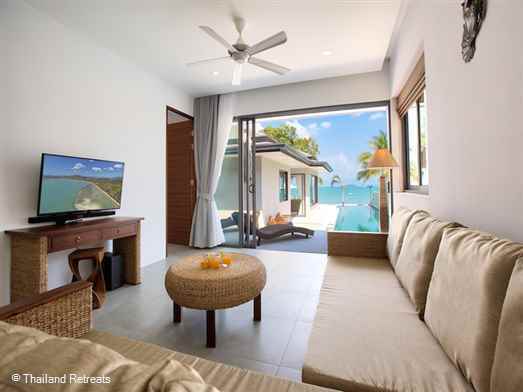 Samui Beautiful Beach Villas is a Koh Samui beachfront property set on stunning Big Buddha beach perfect for extended families and groups of friends. 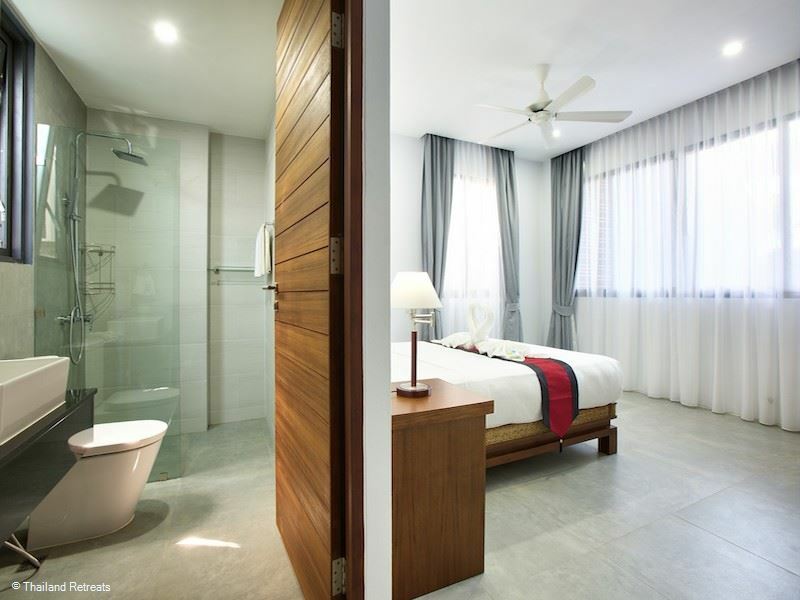 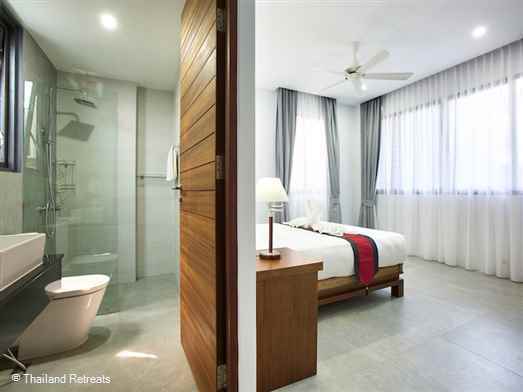 Close to Bophut and 10 minutes from lively Chaweng. Offers rates for 3,4,5,6 and 7 bedroom occupancy. 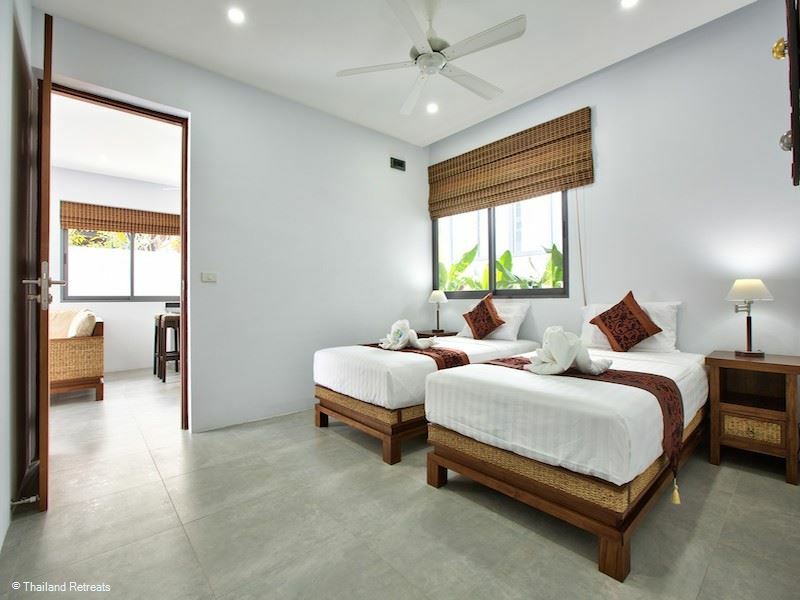 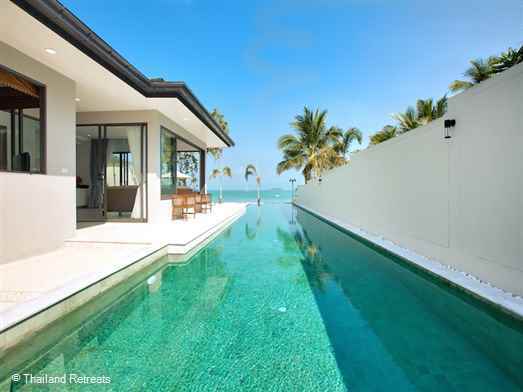 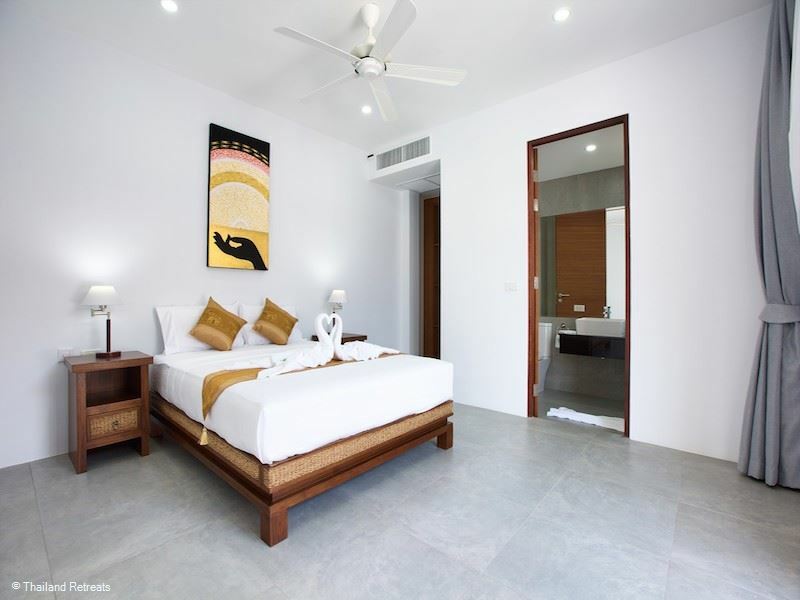 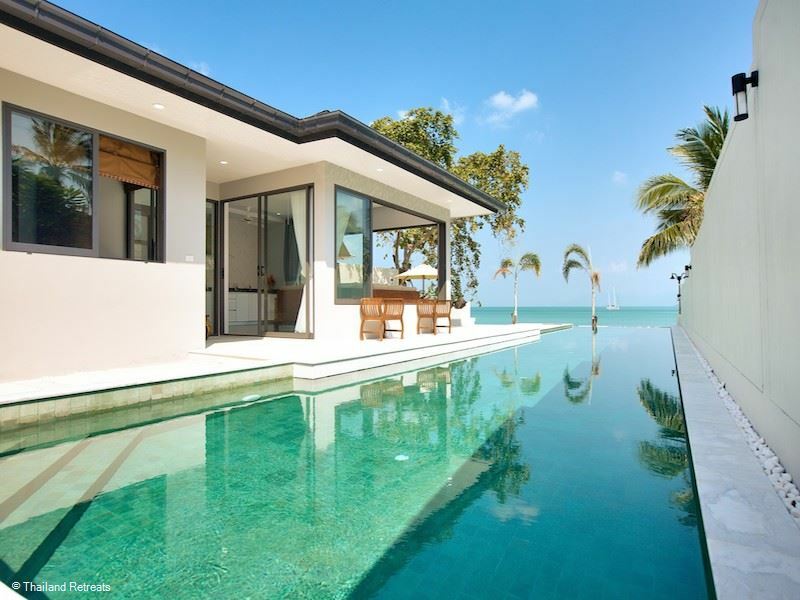 Samui Beautiful beach villas is a perfect villa for chilling out with friends or family set on the white sands of Buddha beach located on the edge of the bustling village of Bang Rak with ample choice of restaurants bars, convenient stores and tour shops within walking dstance. 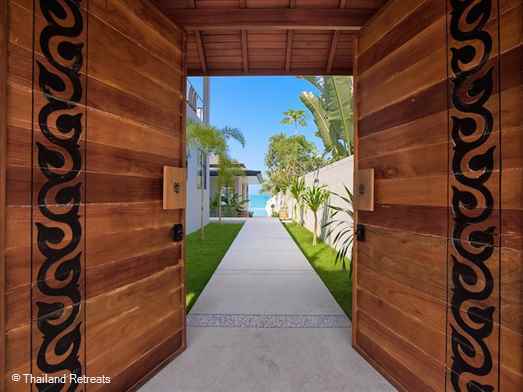 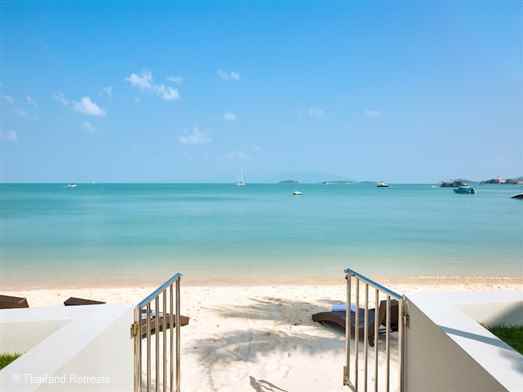 Walking through its main wooden double doors brings you to a long path overlooking the vast 20m swimming pool and beyond that, the crystal blue waters of Bangrak beach. 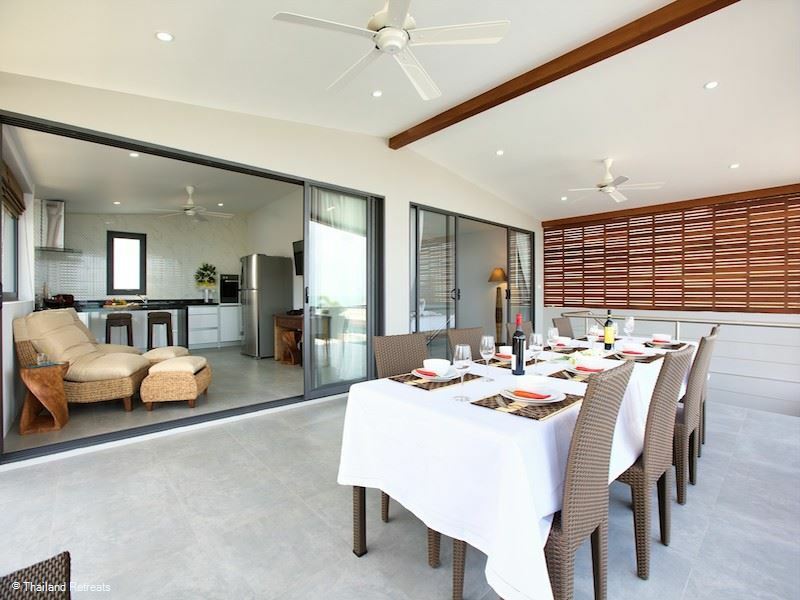 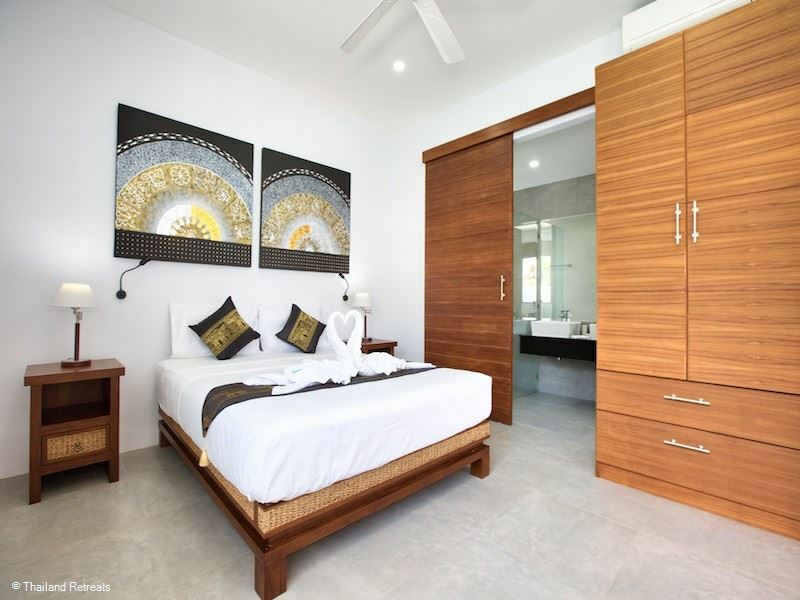 Immediately to your left is the 4 bedroom split level villa, with 3 bedrooms on the ground floor, each with their own sleek and stylish en-suite bathrooms with rain shower heads – perfect for guests. 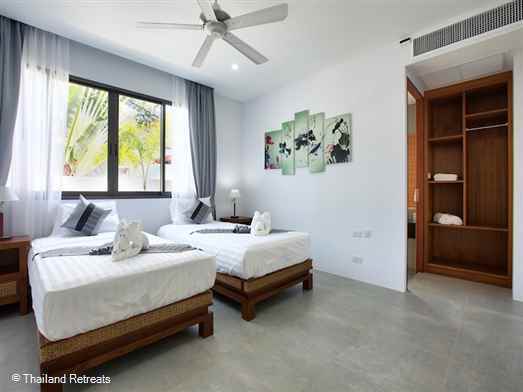 Twin beds and 2 queens are available and easily configurable. Walking up the stairs brings you to a vast open outdoor space where dining and kitchen merge in to one, with a generous outdoor living/dining area offering incredible sea views. A modern kitchen which blends seamlessly with house, sits adjacent to the dining deck with complete western fittings including microwave, oven, double fridge/freezer and all the modern necessities of home. 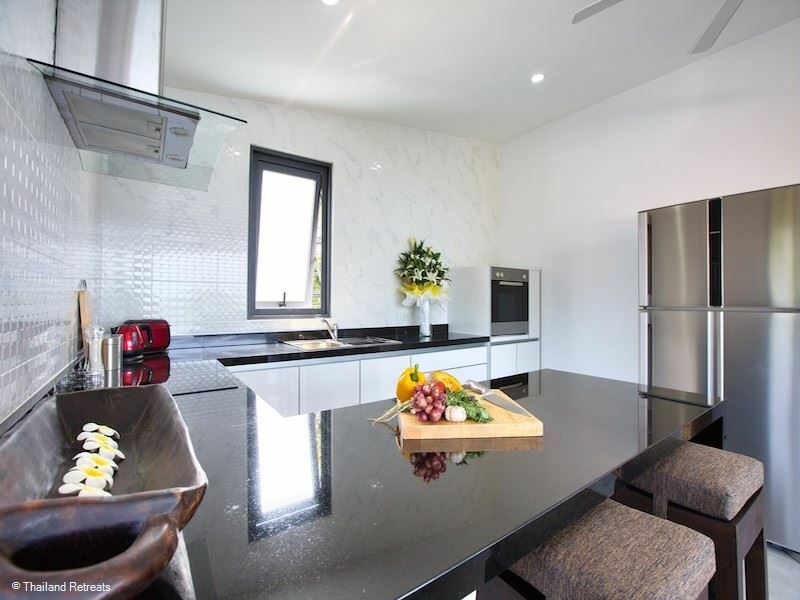 The kitchen allows for easy entertainment for guests, friends and family alike - creating a centre for the house where food and company can be enjoyed by all. 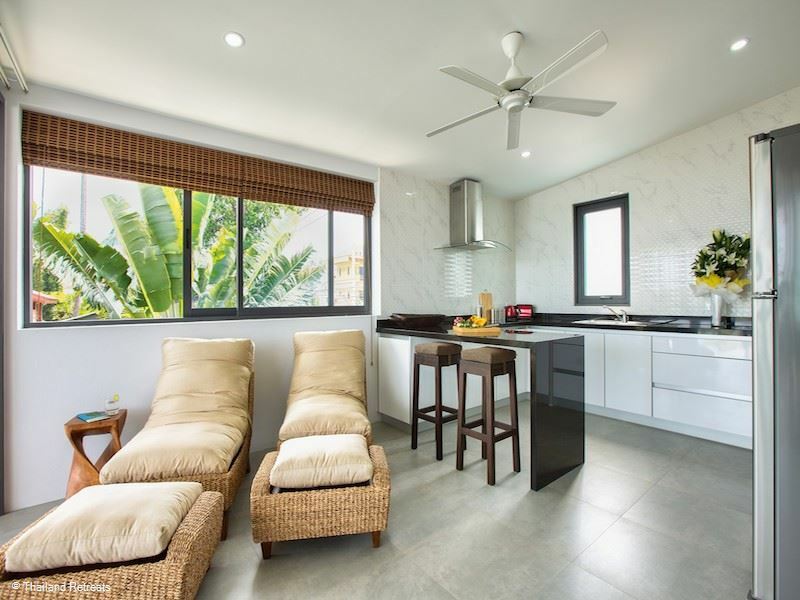 The indoor living area adjoining the kitchen offers a flat screen TV and sound bar, where you can connect and entertain yourself for hours. 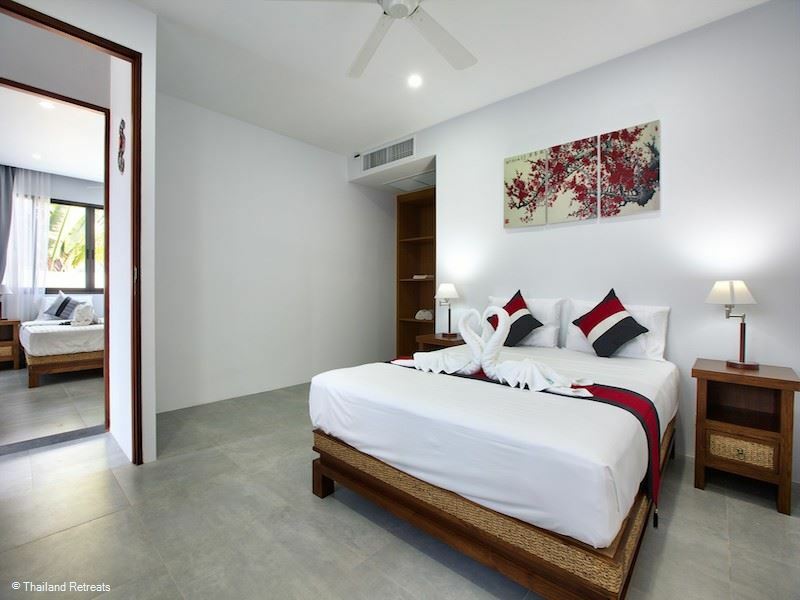 The 1st floor is also home to the master bedroom, with huge glass sliding doors offering sea views where you can spend your days in bed catching up on much needed rest in air-conditioned comfort, or outside enjoying the sea air. 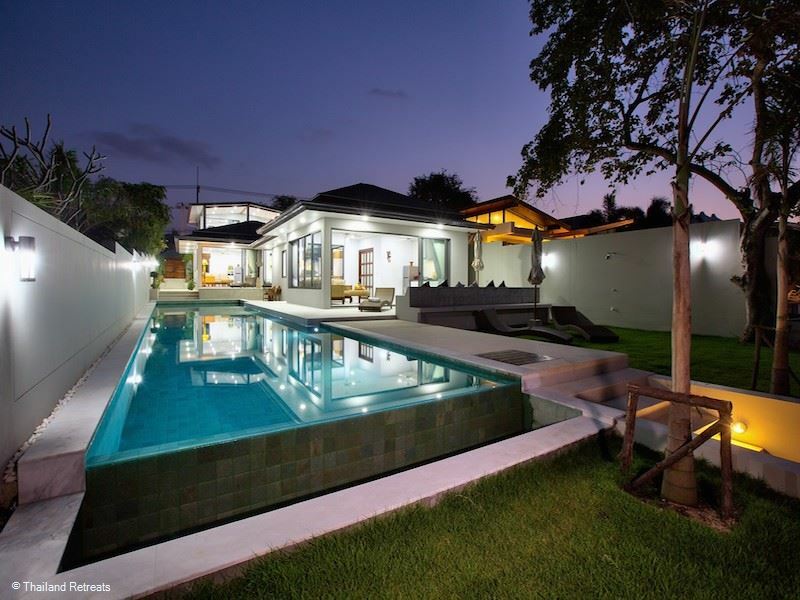 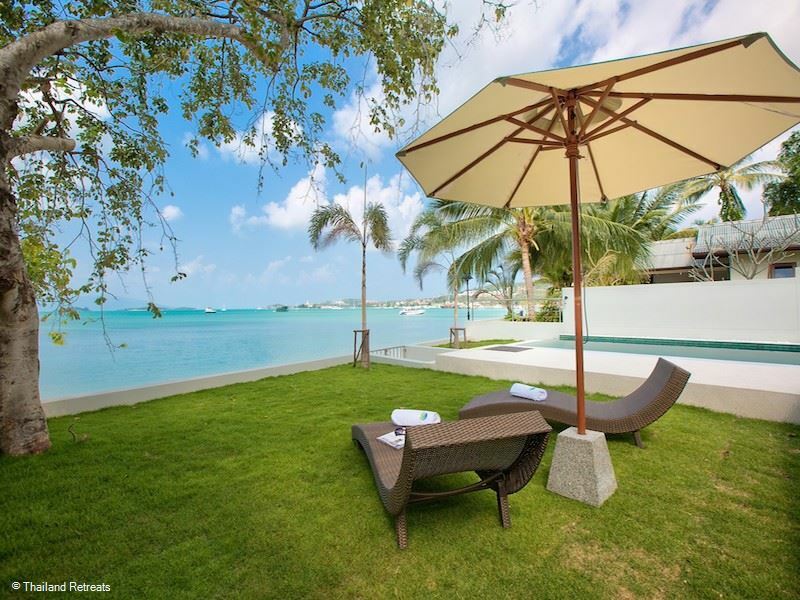 Situated directly in front of the 4 bedroom villa is a 2 bedroom villa. 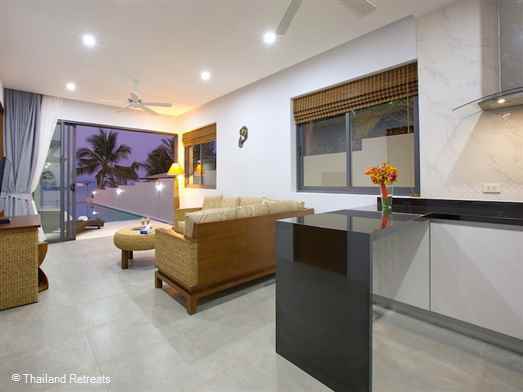 All on one level, the 2 bedrooms (one with twin beds and one with queen) with their spacious modern en-suites adjoin the spacious living/kitchen area with huge glass doors leading out to a small outdoor area complete with sunbeds, sea and pool views. With a fitted modern kitchen, breakfast bar and sprawling 6-seater sofa, Flat screen TV and sound bar - sit back, relax and feel the sea breeze on your skin. 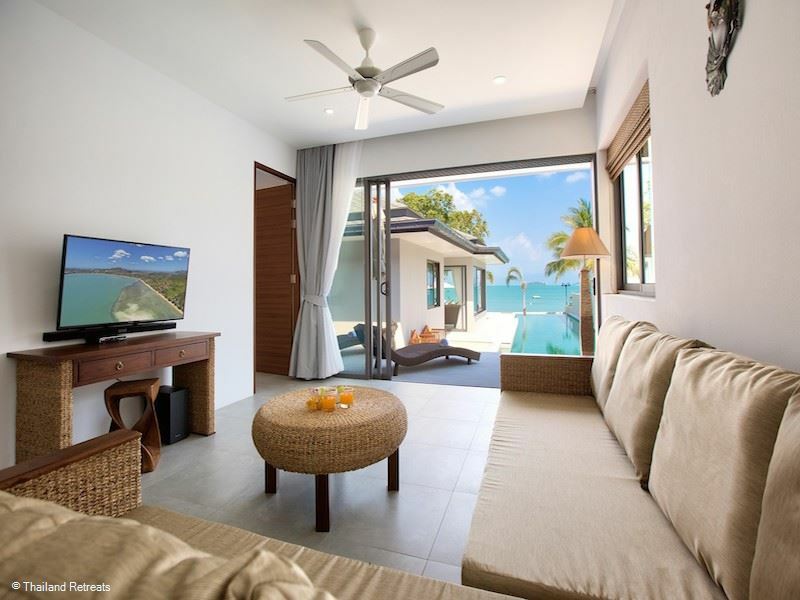 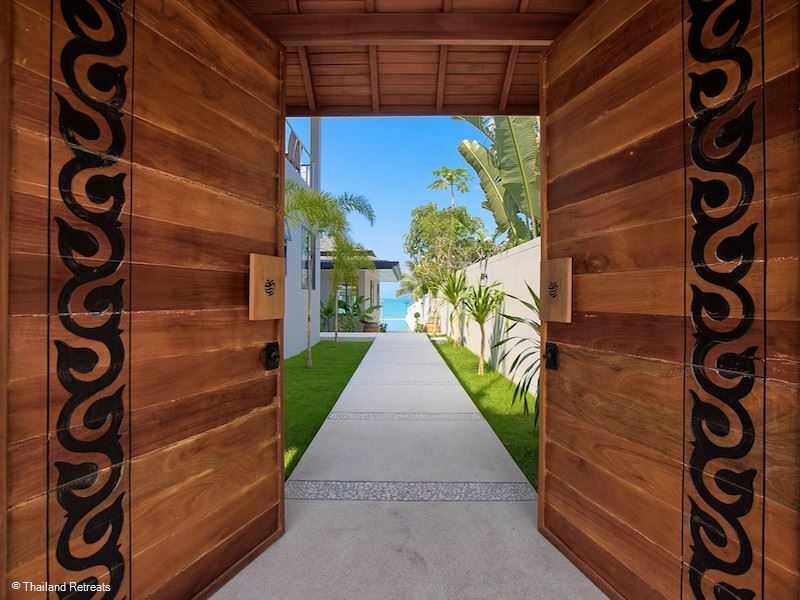 Last but not least is the 1 bedroom beachfront villa -again complete with living/dining with a modern kitchen and a bedroom with queen size bed, flat screen TV and private sleek en-suite - this villa captures the views of the beach and pool all in one. 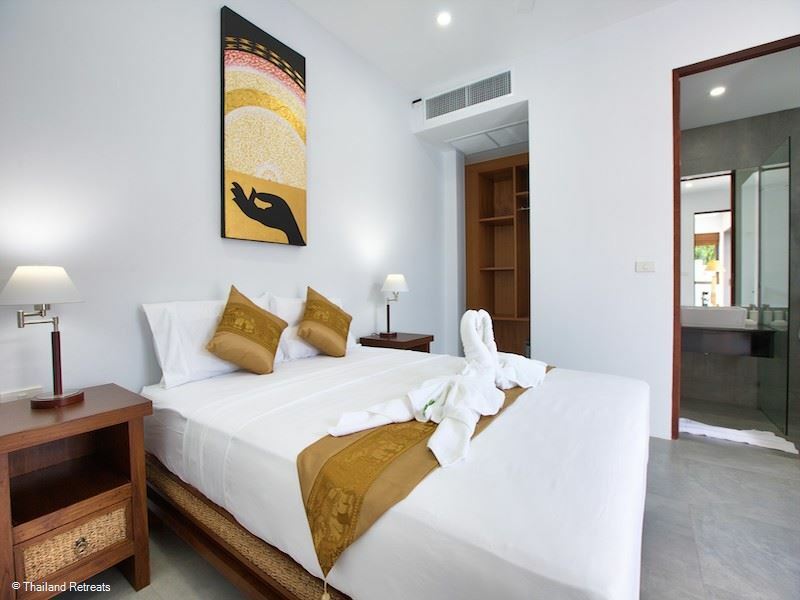 Thai art graces every wall as well as down to the finer touches of cushions, throws and sculptures giving you a modern sleeping space with a traditional edge. 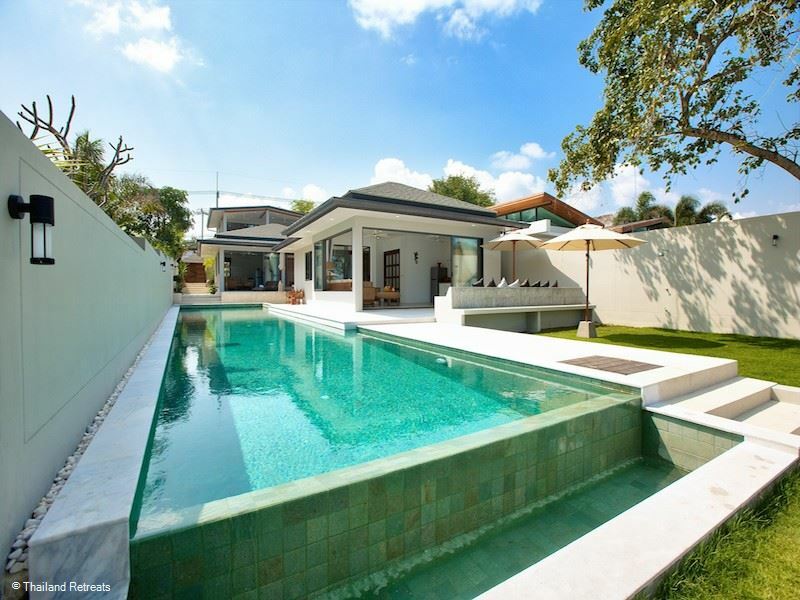 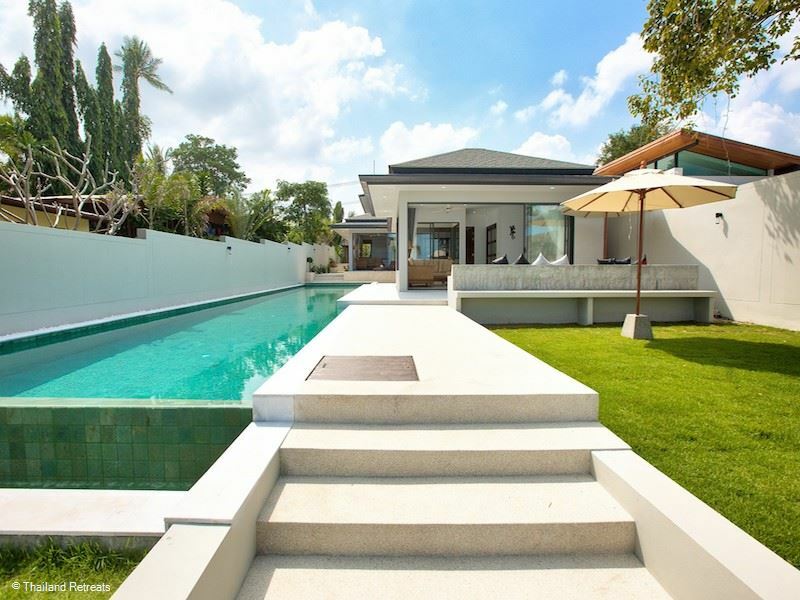 Whether indoors enjoying the eye catching beauty that adorns the walls or outside watching the clear Samui sky – this luxury villa is perfect for those seeking luxury and relaxation and is sure to form part of an unforgettable holiday. 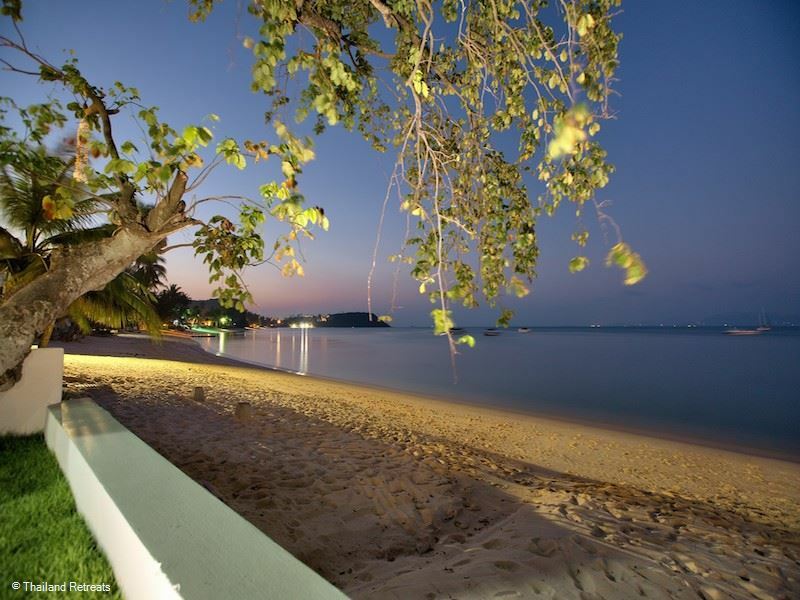 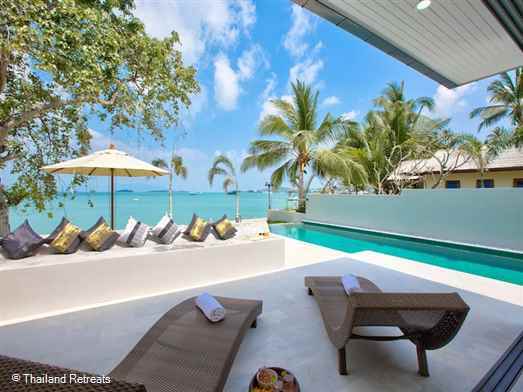 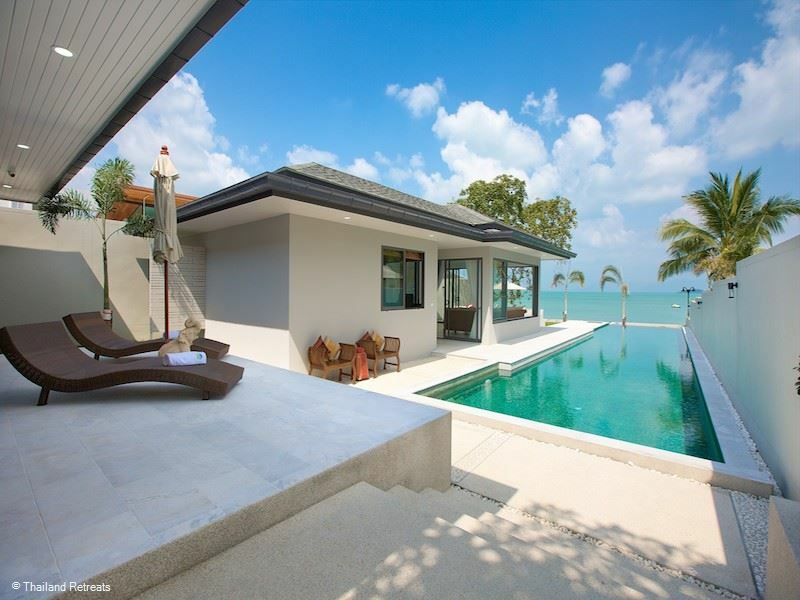 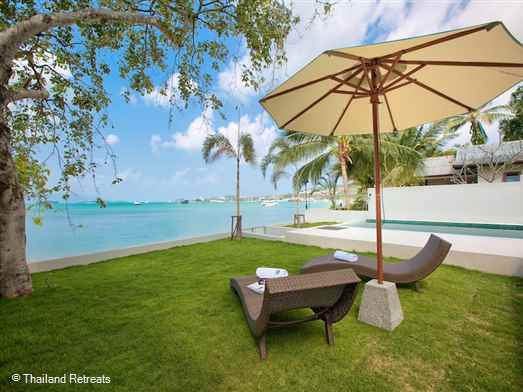 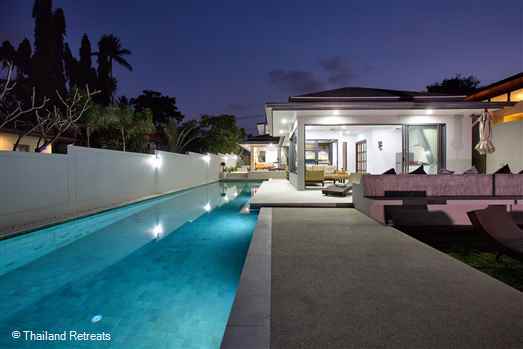 Outside of this luxury 7 bedroom Samui villa down on the beach edge, is an entertainers or relaxers delight. 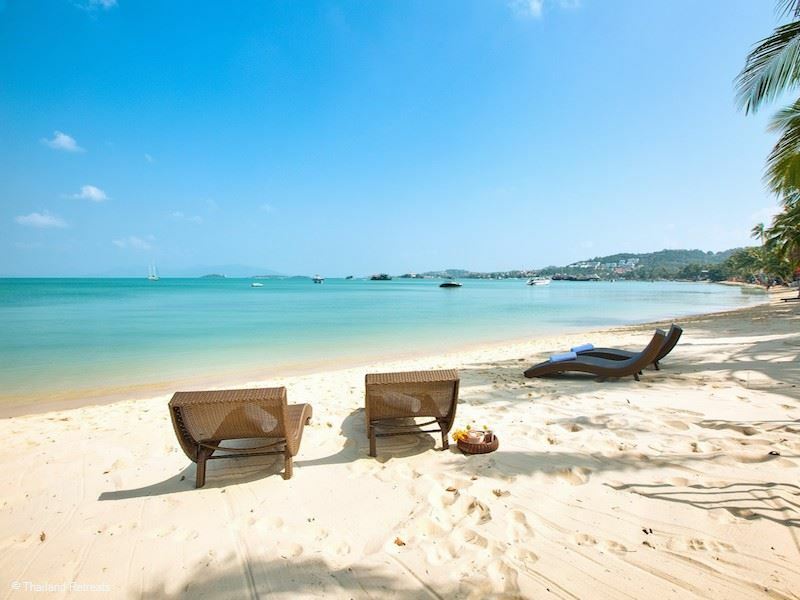 A crystal clear pool sparkles in the sunshine surrounded by sun-loungers (and inflatable pool toys for the children) and sizeable parasols, so guests can choose to enjoy Samui’s rays or take refuge from the heat in some shade. With outdoor dining for 14 in the 4 bedroom villa and a BBQ that allows you, or our Private Chef, to grill up some of the offerings of the island such as lobster and prawns, this villa truly provides the luxury and pleasures that you look for in a remarkable beachfront holiday experience.